Fangs for the Fantasy is all about Urban Fantasy. To some degree we’ve touched on other elements of speculative fiction, but Urban Fantasy is our main passion – in any forms, we’ve covered books mainly but we also have a huge number of TV show recaps, films, comics and computer games. If it’s our genre we’ll grab it. We were both blogging elsewhere before we started Fangs, Renee in particular was writing www.womanistmusings.com and more and more Urban fantasy conversations, discussions and reviews crept into the space. We spent a long time discussing books and emailing back and forth as well. We started a podcast first, and eventually brought the increasing posts, podcasts and discussions to a space that focused entirely on them – and it just exploded from there. I’m actually afraid to add up the hours. Honestly, my tablet never leaves my hands, I’m either writing notes or reading the next book. The shows we watch alone are probably easily 10 hours or more a week. Then there’s doing other things and thinking about it, preparing Friday Discussions, talking every night about things, comparing links, noting conversation pieces, preparing scheduling, looking for new shows and books… It’s scary. A month? Well Fangs has a regular schedule – 5 books a week are reviewed. One of them we both read, and the remaining are split between us. So about 12 books each a month. Frankly we live in constant terror of running out of reviews – our precious precious stock (we usually have reviews scheduled weeks in advance) has caused us to obsessively stare and count the days before we run out of content. One of my pleasures is looking at the list of reviews and just having a little gleeful “all of that. We did that. That’s us”. It pleases my organisation brain to see them all lined up. We also really love the friendships and relationships we’ve developed with other bloggers and authors that we never dreamed of having as just readers – it’s a plug in to a whole different community. On a lighter note – deadlines. There is a special kind of horror that comes from happily browsing netgalley, edelweis or several publishers and then realising that you’ve just agreed to read 8,568,998 books by next Saturday. Of course there’s also the pain of seeing your favourite authors ending series you love like family – while other authors are gleefully hacking out book 18 and you feel duty bound to keep following though every word is like a needle to the eye. We would wish for more respect for what blogging is. There is so much time and effort that goes into a blog and a lot of dismissal of that – not understanding how much time and work we put in, or our very extensive reading of the genre. Equally I think that same dismissal causes too many authors to mistake us for easy advertising or PR which has lead to so much drama. Read. A lot. See what’s out there, see what’s been done and don’t feel like you have to follow in the footsteps of those who have gone before. Too many stories can feel very written-by-numbers. Also, realise there’s a whole market out there of readers desperate for major marginalised characters; we want to see ourselves, we’re not a risk to be included – we can be an asset and an automatic fanbase. Again, read – we think reviews benefit greatly from you having a greater genre context. We’d also says it helps to be involved in the blogger community – reach out to other reviewers. And, lastly, at some point, unless you are a Sunshine Suzy, you WILL get an author/fan/editor/publisher/agent swooping in and accusing you of murdering kittens. Don’t be afraid, don’t be intimidated, don’t panic, don’t rage. Keep calm. Keep professional. Be very respectful – and be sure when the whole trainwreck hits the internet (and it will), you’ll want to be looking like the sensible one. Urban Fantasy! Any kind of Urban Fantasy – but nothing outside of it (our to read list is huge enough). We don’t read erotica and we’re not big fans of Paranormal Romance. Yes – certainly. This is something we’re passionate about. However, be honest about what your book is when submitting a review – and keep it professional – we have so many submissions which are either looking for a beta reader (not our job) or include a lot of extraneous information (sob stories are common – you can’t guilt us into a high rating). Very rarely – the sheer pressure to keep up our reviews doesn’t leave much time. Besides, we love this genre. Renee is currently tackling the Outlander series. She is not having fun. Not at all. This could go on for pages. We’ve actually written so many Friday Discussions and outright drinking games about some of the most mind numbingly common tropes and patterns. We could write a book! DNF! We’re happy to DNF. Life is too short and we have far too many books to read, to spend hours forcing ourselves to read books we hate. We don’t DNF often, but it’s a perfectly valid choice when a book becomes painful – and a perfectly reasonable review. I mean, if a review is an honest opinion of a book, then “so terrible I couldn’t finish it” is relevant. 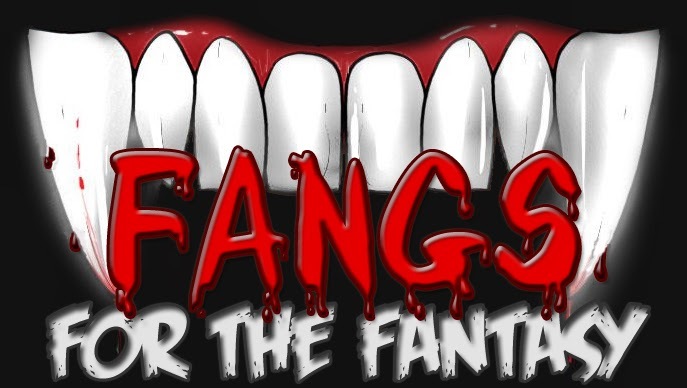 Check out Fangs for the Fantasy or follow them on Facebook or on Twitter. This entry was posted in Uncategorized and tagged Blogger spotlight, Bloggers, Fangs for the Fantasy. Bookmark the permalink. « Blogger spotlight: Calling Book Bloggers!